Born on September 9, 1828, in the Russian Empire, Count Lev Nicolayevich Tolstoy, known as Leo Tolstoy, was one of the greatest novelists of all time as well as an influential and prominent essayist, playwright and philosopher. Also famous for his extreme ascetic and moralist beliefs, Leo Tolstoy was also an important figure of moral reasoning, the reform movement, and of Christian anarchism. Born to wealthy parents belonging to the old Russian aristocracy and who passed away while Leo was still a child, Tolstoy grew up on the family estate – Yasnaya Polyana – together with his four siblings. After receiving his education at home, he attended Kazan University from 1844 until 1847 where he studied oriental languages and law. After his studies were completed, he returned to his estate and in 1851, he joined the army with his brother and started writing short stories. From 1847 until his death, Tolstoy kept a diary, which has made him one of the more documented authors in history. In 1862, he married Sophia Andreevna Behrs and they had 13 children together, three of which died in infancy. He was a proponent of democratic education and he founded 13 schools based on the principles set in his essay The School at Yasnaya Polyana, which was published in 1862. The most controversial aspect of Tolstoy’s philosophy is represented by his belief in the futility of the government and the efficacy of the ordinary, contrary to the beliefs of the great thinkers of his era. After the moral crisis when he was in his 40s, he started seeking God through logic or reason and truth in order to come to a complete understanding of life. Tolstoy firmly believed that small incidents and decisions taken by common people, rather than major events, truly make history. The pivotal point of his thought is expressed by his preference for contingency and particularities in everyday life. Tolstoy was a fervent pacifist and his non-fiction masterpiece The Kingdom of God is Within You (1894) was banned in Russia. It was considered a key book for non-violent resistance and Christian anarchist movements worldwide and it greatly influenced prominent personalities of the 20th centuries, including Martin Luther King, Jr. and Mohandas Gandhi. His most notable and longest literary works include Anna Karenina and War and Peace, two masterpieces of realist fiction. 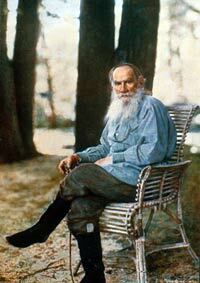 Leo Tolstoy died of pneumonia at the age of 82 on November 20, 1910, at the railway station in rural Astapovo, Russia. He is buried at his family’s estate of Yasnaya Polyana. He was survived by his wife and their ten children.